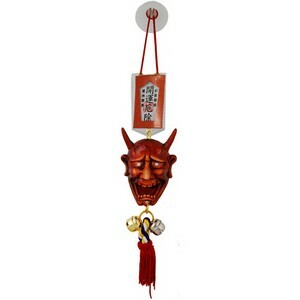 Hannya hanging omamori ornament to ward off evil spirits and bring good luck. This particular omamori is designed to display in a car as protection against accidents. The main script reads "kaiun" (open the path to good fortune) and "yakuyoke" (prevent evil). The smaller script reads "kanai anzen" (please keep my family safe and well) and "koutsu anzen" (drive safely/ safe journey). The hannya noh mask, with pointed horns and metallic eyes and teeth, represents a vengeful and spiteful woman turned demon. Colour of card and cord variable.